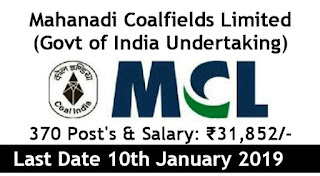 MAHANADI COALFIELDS LIMITED (MCL) is a Coal India Limited (A Government of India undertaking) invites online application from citizens of India for the following post the candidates fulfilling the eligibility criteria many submit their application by online mode only. Educational Qualification: Candidates should have done 10th with Survey Certificate of competency/ Mining Sirdarship Certificate of Competency/ Diploma in Mining Engineering or its equivalent qualification from a recognized university. 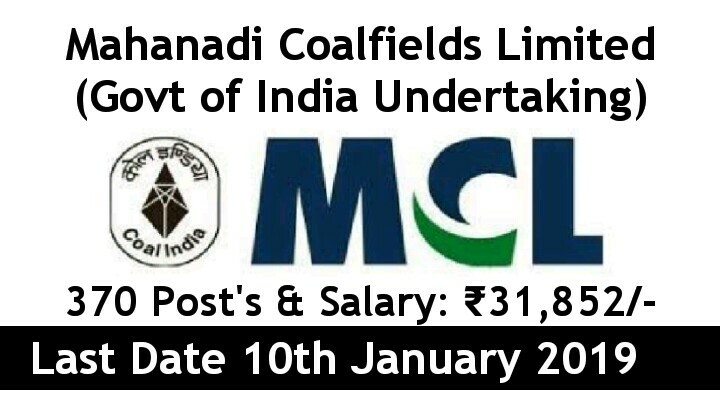 ●How To Apply:All Eligible and Interested candidates may fill the online application through official website http://www.mcl.gov.in before or on 10th January 2019.